We all have hopes and dreams for our children. We believe we know what is best for them, and we go out of our way to make it happen. We bend rules, seek guidance, try to find loop holes to make our youngsters “better” than we are – more successful, to have more options, more financing. My mom grew up going to school and coming home, maybe babysitting, and hanging out with her friends and family. With me, she took it a step further – get good grades, have lessons of anything you want (swimming, ballet, flute, tennis), but there was never any pressure and, when I wanted to quit, I was allowed to do so. My generation of parents (and the generation before me) are taking it even further – get straight A’s, go to an Ivy League college, become a doctor. Do it until it’s done right – the parent’s definition of “right.” And we hover. We need to make sure that when our youngster is tying their shoes, they’re making a bow with the right string first, because that’s the “right” way. Our youngsters are doing things “right,” but us parents want them to do it “better.” It isn’t good enough now-a-days to get that 4.0 grade point average – they need a 4.5. There’s this idea that our child can’t do it right by themselves and, goodness forbid they should be left to their own devices, so we need to “helicopter parent” them. The term “Helicopter Parenting” is not new. It was actually coined in 1969 in the book Between Parent & Teenager by Dr. Haim Ginott, but it started gaining wide use in the early 2000s by college administrators. Parents would hover over their children – calling them to wake them up for class, checking in to make sure homework was completed, reminding them to brush their teeth. These parents start forgetting that they had their own lives and focused solely on their children. It has gotten to the point that some parents are completing tasks that were expected of young adults “back in the day.” We wonder why this new generation of young adults have such a sense of entitlement, but it’s not their fault. It’s ours. We are helicopter parents, and our young adults are now having the hardest time launching into adulthood because of it. 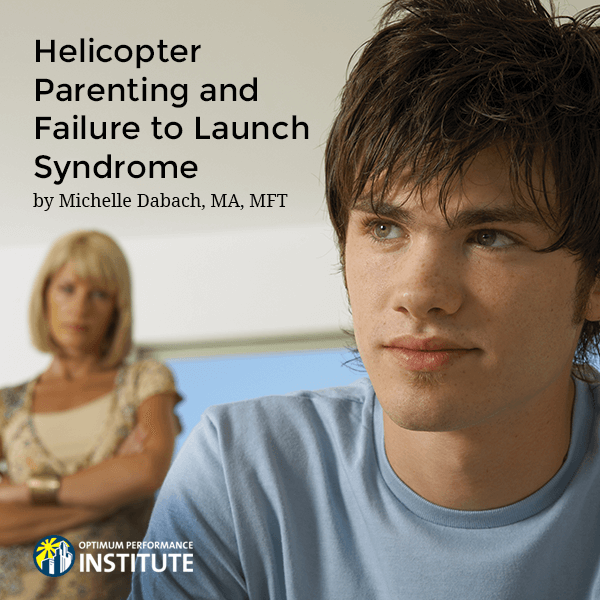 Failure to Launch Syndrome is becoming more and more known as young adults choose to allow their parents to do things for them (or, more commonly, they are forced into this arrangement), as this is how they’ve been raised. And, because we created this, we enable our young adults by providing them with a place to live, giving them spending money, allowing them to live with us rent free. They are our babies, after all. But what we are doing is harming them. Our need to control, to make sure things are done “just so,” is hampering our young adults’ ability to launch, to thrive. Failure to Launch Syndrome is just the tip of the iceberg. Accompanying FTLS is often depression, anxiety, lack of self-esteem, substance use to deal with these negative feelings. And, because everything is always being done for them, the young adults might not recognize that these symptoms are hampering their lives. They might not realize that it’s not normal to sleep until 1:00 in the afternoon or to play video games all day long. They might not realize that maybe some of their classmates have started lucrative careers, while they’re still living at home having mom do their laundry and dad pay their bills. The depression and anxiety perpetuate the nothingness that their lives become and, in return, us parents get frustrated. Why aren’t they doing anything with their lives? Why are they home all day long watching tv, sleeping, or playing games? Why aren’t they “normal”? Did you know there are at least 17 different ways to tie your shoes? Just as there are so many different ways to accomplish this simple task, so, too, are there different ways to live life and accomplish goals. So, your young adult goes to junior college. So what! They’re saving you tons of money, exploring what they actually want to do when they “grow up,” and are making that decision on their own. It’s one of their very first adult decisions to make! And, if your young adult wants a gap year to explore the world? Why not! They’ll soon enough be tied down with work, kids, and a household of their own to take care of. The goal of parenting isn’t to hover, to be a “helicopter.” It supposed to facilitate creating another useful member of society. And, the only way to accomplish this is to stop hovering. Let your young adult explore life. Guide them, advise them, be there for them, but stop doing for them. Let your young adult make mistakes and learn from them. Let them figure out how they want to live. And, always, not matter what, love them and be there for them. For the extreme cases, there is specialized help at Optimum Performance Institute. OPI specializes in Failure to Launch, while offering clinical help to deal with the mental health symptoms and/or diagnoses. Our trained therapists are skilled in pointing your young adult in the right direction, helping them to figure out what it is they want to do with their lives, and giving them the motivation to get it done.